Running of the Sheep West Texas’ Idea of Fun, San Angelo Texas. It’s mutton mania, West Texas style. There’s little other way to describe the ordinarily quiet San Angelo during The Running of the Sheep. On the last Saturday in September, local West Texan’s showcase their idea of “fun” by releasing a herd of sheep in the downtown streets. Not a baaaaaad way to spend the day. In what began as a unique celebration in 2003 to coincide with the city’s centennial celebration, this Wild West version of Pamplona’s Running of the Bulls transforms the cityscape, nodding to its “Wool Capital of the World” status from days of yore. 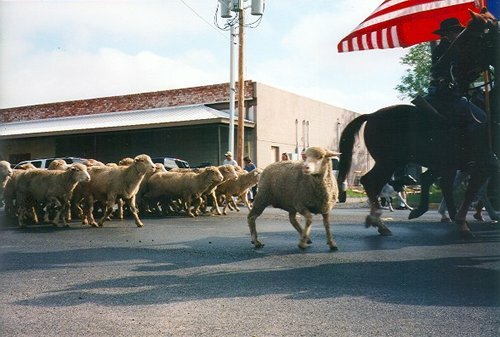 A herd of sheep (100 the first year) are released from the back of a trailer and are to run along marked downtown streets (one of which crosses the Concho River) lined with human and vehicular barricades to the ending mark of Fort Concho where celebrations, including an International Lamb Cook-off, ensue upon their safe arrival. Simple enough. Herding sheep, however, especially on city streets, is a bit messier in practice than in theory. In 2003, nearly 3500 locals and visitors gathered for the first Running of the Sheep. 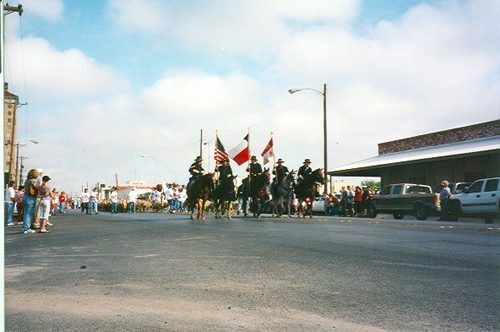 A cordon of flag-waving cavalry and a lead goat paraded the herd down the asphalt, aided by the local 4-H and FFA members. And several befuddled Border Collies. The “Running” was more of a stop-and-go trotting. Sheep, by their very nature, are followers; they simply need something to lead. In all the chaos, there seemed to be too many leaders. That, coupled with the wide streets, caused uncontrollable bleating and the subsequent overtaking of the lead goat. A couple of the sheep broke through the barricades and were corralled heading towards the river. Several encircled a minivan with passengers. Some turned around and wanted to get back into the trailer which brought them there. A single horsedrawn carriage full of West Texas dignitaries concluded the parade. Participants then followed it, along the same route the sheep took, to Fort Concho where the sheep were safely penned. Participants were rewarded post-ruckus with a celebration including speeches, music, demonstrations, local artisan displays, and, teams competing in the Cook-off. Needless to say, the most popular booth that afternoon was the one selling lamb chops served on tortillas—Sans utensils, sans napkin. 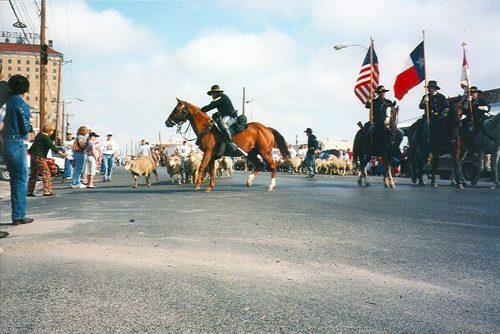 The Running of the Sheep has now become an annual event, coinciding with several other exciting activities, some of which have included the San Angelo Stock Show, 10K Armydillo Run, downtown Fun Fair, Museum of Fine Arts Family Day, Fort Concho Archaeology Day, and the Rotary Shrimp Fest. The 2005 event is slated for September 24. Bring your running shoes. The beginning of The Run, with the sheep rounding Oakes Steet against the backdrop of the historic downtown Cactus Hotel.